So we’ll start with credibility. The column is not a peer-reviewed resource, but then again neither is this blog. The author is a retired Extension specialist with research publications in compost science. That would seem to fit well with the topic. We’ll give it the benefit of doubt for now. How about relevance? Is this information relevant to the use of mulches in home landscapes? Absolutely. Is this accurate information? At this point the column starts to fall apart. Let’s start with the photo (you’ll need to go to the linked column to see it). This tree didn’t die because of mulch, but because it had girdling roots – the result of planting trees improperly. Furthermore, there is no mechanism I can think of in which mulch would “strangle” a tree. Next, there is no distinction made among different types of mulch. Bark is not the same as wood chips, and coarse materials function differently than fine mulches. Bark mulches don’t absorb water like wood chips do, and fine mulches inhibit air and water movement into the soil (coarse mulches don’t cause this problem). Finally, there is the statement that repeated application of bark will raise soil pH and increase manganese levels. There is no research I could find to support either one of these claims. The purpose of this column was to educate – but it has failed to do so for the reasons outlined above. Where did the CRAP analysis fall apart? We need to go back to looking at the author’s credentials. It’s not apparent from his publication record that he’s researched mulches at all. His work was primarily on composts, with the most recent article published in 1998. Nor has he published articles relevant to management of woody plants. Urban horticulture and arboriculture are relatively new fields of study that are rapidly evolving. Information once accepted as factual decades ago may no longer hold true, as newer research changes our understanding of the way that plants and soils work in managed landscapes. Girdling roots are indirectly caused by inappropriate planting strategies. They actually begin at the nursery and are most commonly found in woody material that has been container grown. As trees grow and are stepped up in container size, the roots that have already begun to circle are usually not pruned or pulled out – the tree is just put in a larger pot and additional soil (usually soilless growing medium) is added. This procedure repeats itself, compounding the problem each time the tree is stepped up. At planting time, if the containerized ball is not pulled apart so the roots that are already circling deep in the ball are not straightened out and root pruned, as necessary, you will absolutely end up with girdling roots and a tree with a diminished life span. By the way, what are “arborist” wood chips. I’m a Consulting Arborist and I have never heard wood chip mulch described this way. Not my term but I suspect “arborist wood chips” are wood chips generated by arborists in tree pruning and removal operations. I’m not certain what the difference would be between “arborist wood chips” and, say, tree butcher wood chips. I agree with most of your points above. I am familiar with the production problems and with research conducted by researchers such as Dr. Ed Gillman on the subject. However, many of the same processes you describe in production will occur or will be exacerbated in the landscape when trees are planted too deep and mulched too deep. Why wouldn’t they? I suspect wood chips and pine straw would be less likely to accelerate adventitious root development but I have certainly seen it, post planting, on hundreds of trees which are volcano mulched or mulched/planted too deep. Red maple comes to mind. I agree the problem is out there – but I contend that it’s primarily a function of improperly planted trees with circling woody roots. From a physiological point of view, roots are going to grow in the direction of resources which will be away from the tree. Fine root growth will be limited closer to the tree since there are fewer resources. However, if there is already a circling system of roots that’s not corrected upon planting, then you absolutely will create the problems you describe as these existing roots increase in girth. Bartlett Tree Labs are conducting long term experiments on this topic – so far they’re finding that correct root systems do not send roots back to the trunk. Only the uncorrected root systems persist in this behavior. By the way, I particularly line your statement, “Information once accepted as factual decades ago may no longer hold true, as newer research changes our understanding of the way that plants and soils work in managed landscapes.” Continuing education, and allowing our preconcieved notions to be challenged, is a wonderful thing! Arborist wood chips are freshly chipped trees and branches – as opposed to processed wood chips. They have different qualities so it’s important to distinguish between them. I concur with the idea that improper planting and girdling roots likely caused the death of this tree. However, I challenge the statement, “…there is no mechanism I can think of in which mulch would “strangle” a tree.” There certainly is one I can think of! While it may not have been the case with this tree, deep mulching against the trunk allows trees to send roots to the surface and then spread out. As they do this the secondary adventitious roots surround the trunk. Years later, these roots girdle and ultimately may kill the tree. This happens all the time, especially with maples. Many of the other points are sound. I was taught, years ago, when in school and since that wood chips cause many of the ills the extension agent listed but more recent research debunks much of that. Deep mulching and mulch against the trunk, however, is quite problematic and does result in “mulch murder” very often. Adventitious roots will only grow on trees that are planted too deeply or as you mention are covered in mulch. But these new roots will extend outwards to unexplored soil and away from competing roots. The only time they grow around the trunk is when there is already a circling woody root system – which should have been corrected upon planting. I have seen not circling roots , but randomly surfacing roots mats, which surface through deep soil and mulch and girdle trees. Some tree types are prone to this, many aren’t. Red and Norway maple, all the time. I’m not doubting you do. My point is that with properly planted trees (with corrected woody roots) you’re not going to have active growing points anywhere near the center of the root mass. You just don’t see this happening without something preventing outward root growth (which could include container and tree pit walls). Linda- your statement leads me to believe you have not seen as many girdling root situations as Ron and I have. Girdling roots certainly start with containers but other ways as well, such as glazed or just compacted soil. Excess mulch often causes girdling roots to form as it composts and encourages adventitious root growth. Yes roots are exotrophic but they are easily turned by even slight soil compaction. I have excavated over 10,000 root systems and have seen it happen too many times. I’ve seen a lot of girdling roots – but I sure don’t see them in trees that were planted bare-root and mulched deeply. I haven’t seen any research that’s ever demonstrated that mulch causes circling and girdling. So there’s definitely a correlation between mulching and root circling/girdling, but causation has never been demonstrated. You’d have to be able to show that the roots were not already in a death spiral when they were first planted and mulched. I think you are confusing circling roots with the wider range of causes of girdling roots. Roots need not be circling to be girdling. When a tree is too deep and multiple roots in a root mat surface and spread out randomly, they work together to ultimately surround the trunk, graft together, and girdle the tree. They surface and spread out in all directions, including perpendicular to the trunk. I think you will find Dave Leonard and I see this all the time. In a constrained planting pit of course. In the landscape I doubt it. Roots don’t grow in directions with limited resources unless they have no other physical place to go. 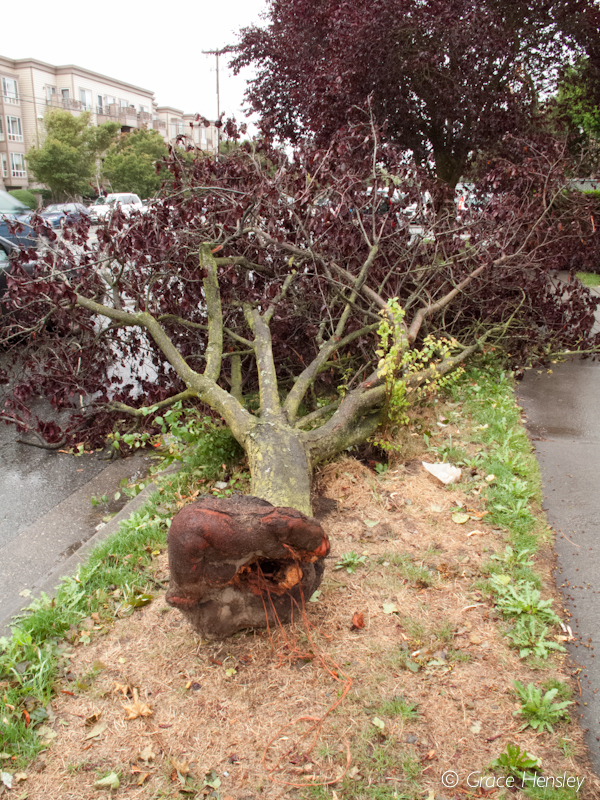 Bonsais are a good example – and must be root pruned to prevent circling/girdling roots. In a relatively unconstrained area you’re not going to see trees with a structurally sound root system doing this. You are not understanding me. Roots which surface and spread out in all directions are not circling, but ultimately they work together to surround and strangle. Roots don’t normally “surface.” They go where the nutrients, water, and oxygen are. The only way you have surface roots is when they’ve been left in a constrained area (container, B&B, tree pit) too long. This is not normal root growth and it’s not something caused by mulching. Trees planted too deeply are another matter altogether. They can form adventitious roots but these go outward, not inward or upward, unless they are physically constrained. For a great example of adventitious roots on a tree planted too deeply see this post from several years ago: http://gardenprofessors.com/being-wrong-counterpoint/. You’ll note that the roots do not circle or grow upwards or form a mat. But they do cause tree decline. Just discovered this web site and am finding it very helpful! Not sure whether this is an appropriate place to ask for advice but it’s related to this topic of how deed a tree is planted: How deep is too deep? We recently had a weeping Norway spruce planted and the root flare ended up about 2″ below grade with another several inches of mulch added on top of that. If we remove the mulch, will the roots get enough air even though it’s 2″ too deep? Or can we perhaps scrape away not only the mulch but a couple inches of soil so we have a recessed disc around the tree several feet wide, about the width of the root ball?—will the roots then get enough air? Or do we need to get a crew to dig up the tree and raise it several inches?! (It was a b&b tree and is now planted in Ohio clay.) Thanks! It would be best to replant at grade. Furthermore, if the burlap and clay weren’t removed, this gives you an opportunity to do so. You can also see whether the roots are impaired and need correcting. I’m in Texas, and we are on the split between rock and clay (Edwards Plateau and Blackland Prairie). I cannot think of a tree in our area that will produce advantageous roots. A tomato? Sure. Tomatillo? You bet. But I’ve never seen a tree do it…or at least any of our trees. Mulch piled too high will cause rot, and cause what looks like a healthy tree fall over as if attacked by the worlds largest cutworm. However, volcano mulching is deadly to a tree. http://hort.ifas.ufl.edu/woody/over-mulching.shtml (just one source, but there are more…including our own Aggies). It really depends the situation into which the tree has been planted. Often tres are not planted into open landscape but in constrained spaces. Given that, one cannot generalize about what any given tree’s roots will or won’t do. 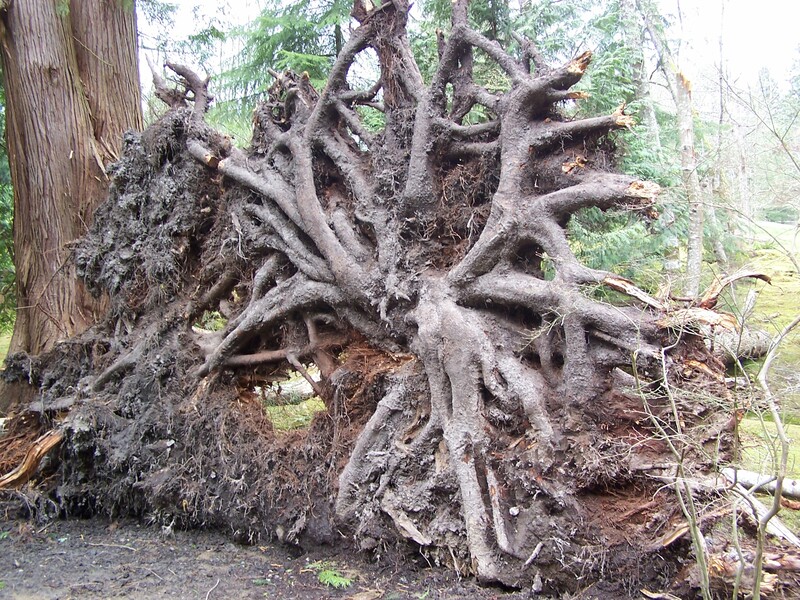 Root growth is often opportunistic and obstacles encountered will often direct growth, some of which will have a negative impact on the tree down the road. No argument there – but that’s not a mulch issue. Roots grow up into mulch then spread out. That is a mulch issue. As you say – they spread out. Not back to where there is competition for resources unless they are physically constrained. This is an ecophysiology issue. I have never seen any scientific research anywhere to demonstrate that roots grow where competition is greatest (unless they are physically constrained). That’s the evidence that woody plant physiologists like myself would need to see. If roots randomly spread out and they go in a generally straight line some will pass by the trunk and ultimately may become a girdling root as the trunk enlarges over years and the roots enlarge. Dave Leonard and I have been seeing it for decades. Yes, it could be and is complicated. However, the research needs to catch up with the reality. Because the research has not been done does not mean it is not happening. There has been ongoing research on roots for years at the Davey research farm, Bartlett Tree Labs, University of Florida, various Tree Fund studies, Morton Arboretum, et al. I am sure our understanding of the exact mechanisms will be refined over time. but I simply don’t understand the reluctance to admit that there is a problem which may be, or I could content likely is, exacerbated by deep mulching. Regarding constrained roots in our area, with heavy, dense, clay soil, nice fluffy mulch is often the path of least resistance, and the area of greatest oxygen and moisture. Up go the roots, they spread out, add 10 years and wala, girdling roots! Research has been done on mulches for decades. There has never been evidence that mulching causes the problems you and I see on a daily basis. It’s an issue of poor root structure that’s left uncorrected at planting. Bartlett’s recent research (which I’ve seen at their labs) has been demonstrating this: http://gardenprofessors.com/an-unusual-company/. I am in Cincinnati. We have heavy clay, alkaline soils. Many are compacted from construction. 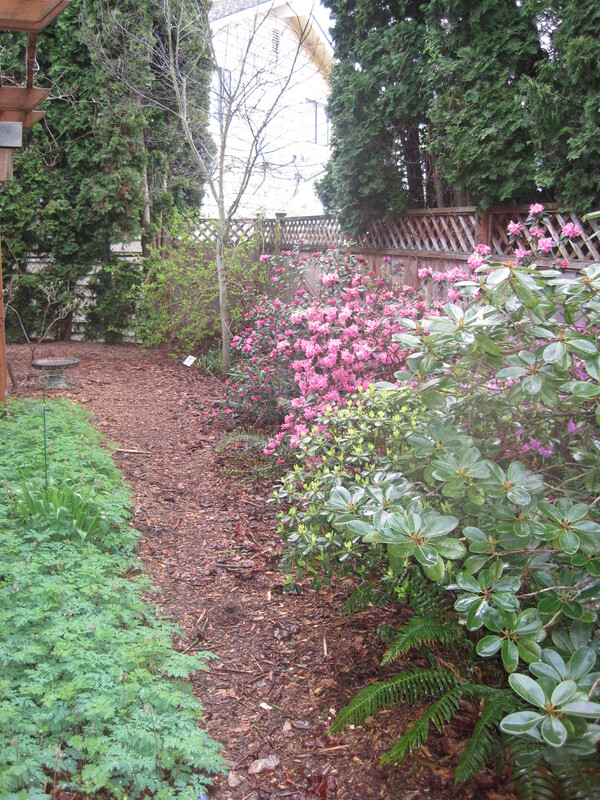 Older neighborhoods are better with less disturbed and compacted soils and more topsoil or aged soils. Container material in heavy clay has never made much sense to me unless much of the growing media is knocked out at planting time and roots are directed into the native soil. Even b and b material is often delivered in soil which is a different texture than native soils, all promoting interface issues. I frequently see root mats in landscapes in certain tree types right up to the trunk, perhaps a function of all of the above to one extent or the other. Mulching deep against the trunk or soil against the trunk only exacerbates the situation. I am reducing my lawn to make a native plant garden. My soil is about 4″ deep and after that it is shale. In the fall I turn over the sod, cover with cardboard, wet the cardboard and then cover with Arborist wood chips. The next spring I make a hole, plant my plant and the area is already mulched. This is my 3rd year of extending the area and my plants are all doing really well. To get the wood chips I merely flag down a truck, ask them if they need somewhere to put the chips and if they say yes I show them my driveway. I am careful that the Arborist has only been trimming trees and not cutting areas where I could be getting Japanese Knotweed or other invasive weeds mixed in. Somewhere along the line we seem to have strayed from the original question. Will arborist wood chips hurt my tree? The simple answer seems to be a qualified no. And, I agree with most of the points about coarseness, water absorption, air circulation, etc. But lets look at other points around the topic of mulch murder. There is a right and wrong way to apply mulch. Mulch volcanoes are ridiculous and invite problems. It still seems prudent not to pile mulch against trunks. Wide but not particularly deep seems to be the most beneficial and there are peer reviewed studies which bear this out. Both Dave Leonard and I do a lot of air excavation of trees, and we see a lot of problems. I will speak for myself and not for Dave, although I bought my air knife from him many years ago and have known him for many years. It seems prudent to delineate the fact from fiction in what causes girdling roots and root defects. Most of the trees I excavate are either planted deep or mulched deep or both. Some or all of this may have originated in production, but I have seen instances where it obviously developed or was greatly exacerbated in the landscape after planting. The mulch is against the trunk. The trees are almost always mulched with fine bark. I don’t know that I have ever worked on a tree mulched with arborist wood chips. I have seen root mats which have developed OVER the root flare several inches thick AND against the trunk. Red and Norway maple are particularly prone to this. So, what are the take home messages? The texture and composition of the mulch matters. How the mulch is applied would seem to matter. Tree production methodology matters…a lot. Holistically, it all matters, and we likely have not figured out conclusively just how all the puzzle pieces fit together. As always, more research will show us more. In the meantime, there are analytical professionals out there with valid observations. If we are going to do research, we may want to dialogue with those seasoned professionals, as was done in the described visit to the Bartlett research facility. And I agree. This was a good discussion. Unfortunately the fact sheet does not link to any published research, and I’ve searched the literature many times for evidence of disease transfer from infected wood chips to trees. There just isn’t any good evidence that this happens in a landscape situation. While it’s true the pathogens can remain viable on large pieces of decaying wood, that’s where they appear to stay. If this was a problem I’d expect to find publications on it (as there in the case of herbicide-treated wood chipped and used as mulch). I have just discovered this blog and I love it! I want to subscribe but can’t figure out how… I just ticked the box “notify me of new posts…” will I get all the blog entries now? Glad you found us! If you look on the lower part of the left hand menu, you’ll see there are two RSS feed buttons: one for posts and one for comments. Click on them both if you like. Love your blog- Myth Busters for horticulture!!! Clicking on the RSS feed buttons only got me a lot of text, no subscribing option. I checked both boxes on the Reply option to receive notifications by email. That doesn’t seem like the same as subscribing. Are those my only options? Sorry, yes, that’s the way that WordPress works. Casual observation suggests to me that improper mulching is probably the single largest cause of mortality of landscape trees in the US today. 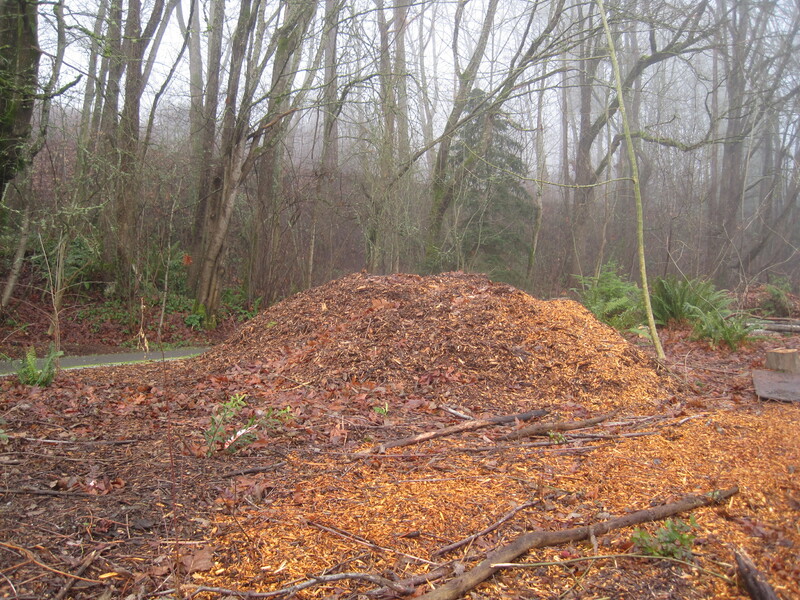 Are you familiar with mulch volcanoes? They’re most commonly found in landscapes maintained by landscapers on distributed-ownership properties (for example, on corporate properties, housing development common land and public properties). Every year, once they’re finished driving edgers through the tree roots growing beneath the surface at the edge of the mulch volcano, landscapers add a new, fresh layer of mulch to the mound. Mulch volcanoes can reach absurd proportions. This summer, while visiting my parents, I walked down a street near their house in which tree after stressed, struggling tree protrudes from a pile of mulch that, I kid you not, can be as much as a yard tall. Every year I visit them, at least one of the 70 or 80 trees on that street has died and been replaced (along with a new mulch pile to get the cycle started all over again). The spectacle on display on this street near my parents’ place is entirely common throughout Eastern US suburbia. As you probably know, correlation is not causation. I wouldn’t be surprised to find improperly prepared root balls beneath the mulch. There has been research demonstrating that deep layers of coarse woody mulch enhance tree growth – as long as they’ve been planted properly. Coarse woody mulch over the root system or up against the trunk? Right now we can only recommend mulching up to the trunk. Some of Jeff Gillman’s research might change this, as results showed a benefit to wounded trunks being covered with coarse mulch, but until that work is published we can’t endorse it. Great article. Something to think about for my Cleveland Tree Service company. Next Next post: Our New Year’s Resolution – to keep you informed and entertained every week.